Rick Steves advocates smart, affordable, perspective-broadening travel. 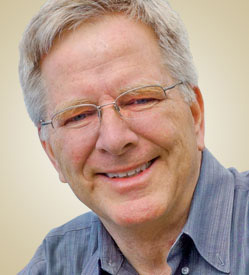 As host and writer of the popular public television series Rick Steves’ Europe, and best-selling author of over 50 European travel books, he encourages Americans to travel as “temporary locals.” He encourages American travelers to connect much more intimately and authentically with Europe — and Europeans — for a fraction of what mainstream tourists pay. Rick is outspoken on the need for Americans to fit better into our planet by broadening our perspectives through travel. Steves took his first trip to Europe in 1969, visiting piano factories with his father, a piano importer. By the time he reached 18, Steves jokes, “I realized I didn’t need my parents to travel!” He began traveling on his own, funding his trips by teaching piano lessons. In 1976, he started Europe Through the Back Door (ETBD), a business which has grown from a one-man operation to a company of 100 full-time employees. ETBD offers free travel information through its travel center, Web site, newsletters, and runs a successful European tour program that attracts around 18,000 travelers annually. Over the past 20 years, Steves has hosted over 100 travel shows for public television and numerous pledge specials (raising millions of dollars for local stations). His Rick Steves‘ Europe TV series is carried by over 300 stations, reaching 95 percent of US markets. He has also created two award-winning specials for public television: Rick Steves’ European Christmas and the ground-breaking Rick Steves’ Iran. Steves writes and co-produces his television programs through his media company, Back Door Productions. Rick Steves also hosts the weekly public radio program Travel with Rick Steves, in which he takes calls and interviews guest travel experts. The show airs across the country and has spawned a popular podcast. Steves has also created a series of audio walking tour podcasts for museums and neighborhoods in Paris, Rome, Florence, Venice, London, and Athens. He spends about a third of every year in Europe, researching guidebooks, filming TV shows, and making new discoveries for travelers.